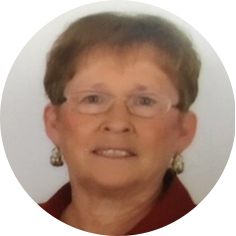 Beverly Ann Waller, aged 73 years of Drinkwater, SK passed away peacefully on Thursday, February 14th, 2019 after a long fight with Alzheimer’s disease. She was born on August 24th, 1945 to Gordon and Anne Williams. Bev will be sorely missed and is survived by her husband, Ken Waller; children: Kim (Kevin) Gulka, Kris (Wendy) Waller, and Stacey (Aaron) Gamble; grandchildren: Krista, Dayna, Naomi, Morgan, Sydney, and Kaleb; brother, Daryl Williams; sisters: Sandra (Gord) Miller, Karen (Emerson) Koch, Kathy (Jack) Gadd, and Terry (Stu) Gadd; as well as many nieces and nephews. Bev was raised on a farm near Bayard, SK and graduated from Briercrest High School. She married Ken in April 1967 and settled into their forever home on a farm just outside of Drinkwater, SK. She was a busy lady with an active hand in farming, raised 3 great kids, played baseball (coached by her mom Anne Williams), and gardening…using her 3 kids as slave labour. In 1984, Bev started working in the kitchen at St Anthony’s Home and later moved over to Providence Place, retiring in 2008, never to see that place again!! Little did she know as Alzheimer’s took her deeper into confusion, she returned to Providence Place, but as a resident this time, after a knee replacement caused the illness to take a much stronger hold. Special thanks to the wonderful staff at Providence Place where friends and acquaintances continued to care for Bev during her remaining years. The Funeral Service will be held on Saturday, February 23rd, 2019 at 10:00 a.m. in Moose Jaw Funeral Home. Chery Thul will officiate and interment will take place in Drinkwater Cemetery at a later date. As an expression, donations in Bev’s name may be made to The Moose Jaw Humane Society, Box 1658 Station Main, Moose Jaw, SK S6H 7K7. Arrangements are entrusted to Moose Jaw Funeral Home, 268 Mulberry Lane. Michelle Surtees Funeral Director 306-693-4550. Ken and family, our sincere sympathy. Thoughts and prayers with all of you at this time of sorrow. Remember the good times and She will always be with you. ON BEHALF OF LLOYD AND MYSELF(RUTH) HARD TIME AS THIS IS SHE IS AT PEACE AND NOT SUFFERING ANY MORE OUR DEEPEST SMYPTHAY SORRY FOR YOUR LOSS. PRAYERS AND HUGS TO YOU KEN AND FAMILY. My sincere condolence to you Ken & family on your loss of Bev. Sandra, Gord and Family…My deepest sympathies to all of you…May your memories of Bev carry you through this difficult time..
Our sincere sympathy to the Waller family.May all the special memories you shared ,be a comfort to you at this time. Extending deepest sympathy to all at this difficult time. Deepest Sympathy and caring thoughts to your family at this difficult time. Treasure the many memories and good times you had together. Our deepest sympathy to Bev’s family at this time of sorrow. It’s so very sad to have a loved one go! Sandra, Gord, and family. Deepest sympathies from Don and me on your loss. Our thoughts and prayers are with you. Sorry to hear of your loss. Our thoughts are with you. Thinking of all of you at the difficult time, sending warm thoughts and great memories of Bev. My thoughts will be with you for many days to come.